As tropical storm BUD spins it’s way north in the Sea of Cortez it’s copious moisture is being drawn into the desert southwest by a large low-pressure trough originating in the Pacific northwest. 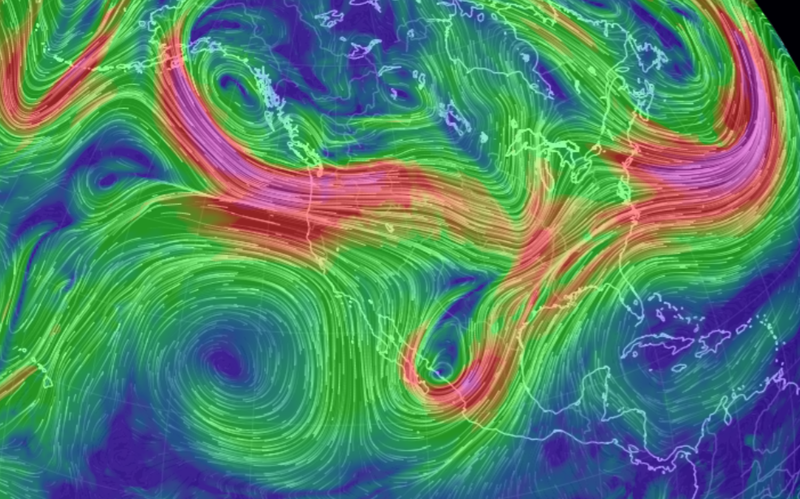 The trough’s counter clockwise spin is drawing in BUD’s energy and up to 1.3″ precipitable water has been measured. When the disturbance moves into the San Juan later tonight and tomorrow we could see some good rains, lightning and flash flooding near the Durango burn areas. Might get ugly if all this activity works in syncronicity. Some satellite photos and vorticity/ precipitation maps below. A big world view of BUD in southern Sea of Cortez about noon MST with the low pressure trough drawing it’s moisture into the desert SW.
Vorticity (measured instability of a vertical air mass), showing the low dropping down from the Pacific NW into southern Cal and the Great Basin today at 12Z. See BUD (yellow & red) at the bottom over southern Baja California. Infrared satellite photo at 12Z today.